Join a group Stand Up Paddle Boarding lesson and experience, the fastest growing water sport in the world! A 90 SUP minute lesson, comprised of 30 minutes of Paddle board instruction, and 60 minutes free SUP paddling. Fast track your learning with a Private Stand Up Paddle Boarding Lesson, comprised of 60 minutes one-on one-instruction and 30 minutes practice. Escape the rat race and get out on a Stand Up Paddle Board with a few mates! 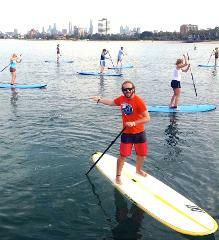 Just hire the SUP gear from the waters edge and go for it at our St Kilda location. No room for your own SUP? Want to maximise your time on the water this summer without the hassle of taking your board to the beach? 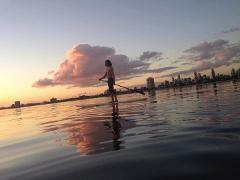 Take advantage of the SUP Hire Card - 10 x 1 hour SUP Hire sessions. Paddle all summer long! Join a Group Stand Up Paddle Boarding lesson and then take advantage of three additional SUP rental sessions. Do something different this summer and take your partner on a SUP adventure! Join a Group Stand Up Paddle Boarding lesson and then take advantage of an additional SUP rental session together. 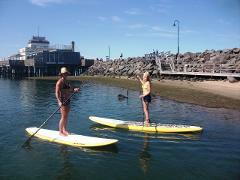 Take a private SUP lesson and then perfect your skill's all summer long! Join a Private Stand Up Paddle Boarding lesson and then take advantage of four additional SUP rental sessions. Take the family on a Stand Up Paddle adventure! Join a Group Stand Up Paddle Boarding lesson and one of the kids paddles for free.